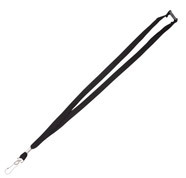 Safety comes first in the workforce or event management and our breakaway lanyards are just the product you need to ensure proper safety regulations are upheld by your company. These safety lanyards come with a clip that unlocks when pulled with enough force meaning your customers & clients won't get choked! Our breakaway lanyards make great key lanyards as well. With all the benefits of a normal lanyard plus that added safety, what more convincing do you need?